NightStay.in, a mobile-based marketplace for last-minute hotel bookings, has raised around $500,000 in seed funding led by Vivek Bihani of Bedrock Venture Management Pvt. Ltd.
Rajesh Sawhney, founder of GSF, and Shailesh Vikram Singh, executive director of SeedFund, also participated in the funding, as per a press statement. NightStay Travels Pvt. Ltd, the company behind NightStay, will use the money to boost its technology infrastructure, improve the core product and expand into 20 cities by the year-end. Presently, NightStay is operational in six cities. "We are focused on creating a win-win product for our users and partners and hence we do not allow bookings beyond the same day. This helps us ensure that our users get the best possible deal available for that particular day and gives our partners an opportunity to monetise their unsold rooms for that day," said Nasr Khan, founder and CEO, NightStay. "We handpick hotels and before partnering with them, we visit each property to ensure the quality. Our users are primarily the last minute travellers who do not always have the time to compare prices on multiple channels, read hotel reviews and then make the booking," Khan added. The company was co-founded by Khan and Deepak Negi in March 2015. NightStay provides last minute deals on luxury and boutique hotels. It procures expired inventory from hotels at a discount and passes it on to customers. "We see a big opportunity in last minute booking space on account of increasing supply side at the hotels and changing consumer behaviour on account of increasing mobile penetration. Further, the NightStay team has deep sector knowledge," said Shailesh Vikram Singh, executive director, SeedFund. SeedFund has previously invested in companies like Chumbak, DailyObjects, CarWale and RedBus. 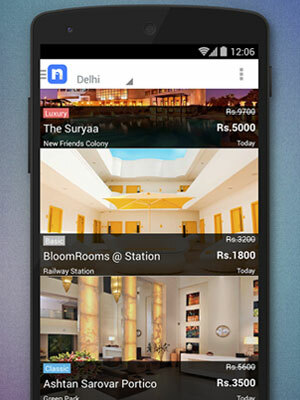 Bangalore-based RoomsTonite, a mobile-based marketplace for last-minute hotel bookings, is another player in the same space. However, RoomsTonite's app enables users to book hotels for the same day or up to three days/nights including the booking day. Bedrock Venture Management Pvt. Ltd. Nightstay NightStay Travels Pvt. Ltd.